Each year we joyously observe Passover: the exodus of the Jewish people from oppression and our celebration of freedom. This year as Passover approaches, it is impossible to enter the holiday without thinking about the state of immigration justice in the US today. Our own histories as strangers in strange lands, from Egypt through today, compel us to stand with immigrant and refugee communities who are battling injustice. Given the current political climate of hatred and fear supported by those in power, it is more important than ever to draw out those connections in our celebration of Pesach. After escaping from Egypt and passing through the Red Sea, the Jewish people came together to sing. This Passover, let us lift up our voices in unity for all those who still dwell in Mitzrayim, the Narrow Place. 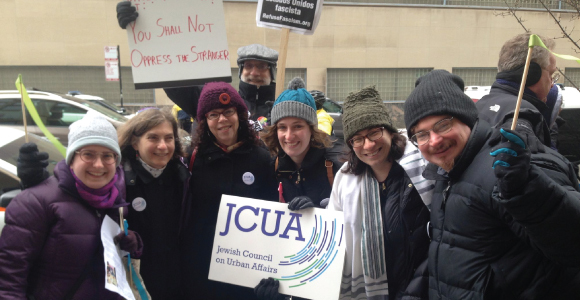 We will continue to fight alongside our immigrant siblings and those in our own Jewish community who are still battling every day to have their voices heard. 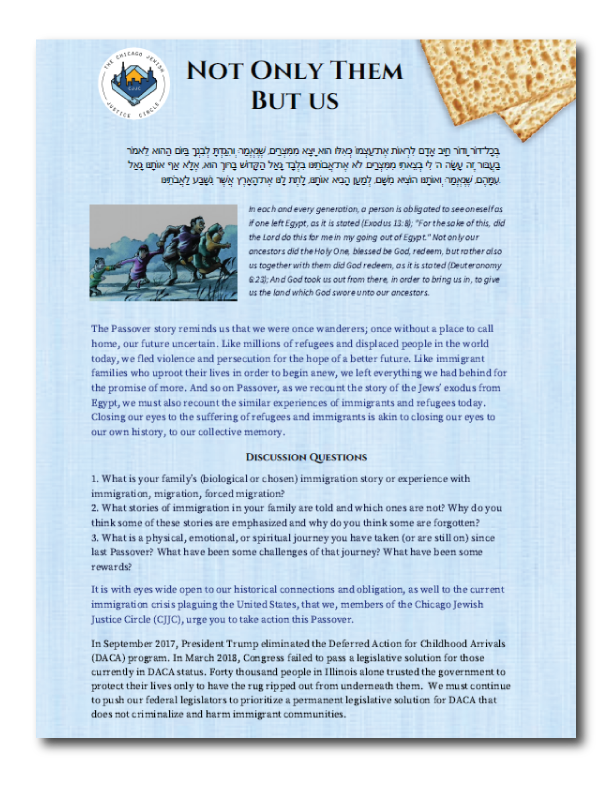 We invite you to use this Haggadah insert, “Not Only Them But Us,” created in partnership with the other members of the Chicago Jewish Justice Circle, a new leadership group of Jewish individuals and organizations who see justice as central to our work and lives. We urge you to reflect on and live your Jewish values by taking action this Passover season. With best wishes for a spirited, joyful, and meaningful Pesach.